The theoretical concepts that underlie holistic healthcare practices are explored along with how these concepts relate to the core values which guide the practice of Healing Touch. Healing Touch techniques used in the etheric field are acquired along with an understanding of how these techniques interface with the human biofield. Explore qualities and self-care needs of a Healing Touch Practitioner. Discuss the facets of Healing Touch and correlate techniques that support physical, mental, emotional, and/or spiritual healing. Demonstrate Healing Presence: the ability to remain grounded, present, and heart-centered. Describe personal perceptions of subtle energy/heart-centeredness. Apply the Healing Touch Framework to a variety of energy interventions. Evaluate the seven energy centers (chakras) and related energy layers that surround the body. Describe rationale with use of specific Healing Touch techniques. Discuss the Healing Beyond Borders Code of Ethics, Standards of Practice and Scope of Practice required of a beginning Healing Touch student. Is Healing Touch for You? Requires a strong commitment to personal growth. Suzanne Weeks, CHTP/I is a Certified Healing Touch Practitioner, Level One Instructor who began her training in San Diego at Scripps Center for Integrative Medicine. She has a Bachelor's degree from U.C.S.D. in Microbiology and works in food safety. She pursues health and fitness in her own life, drawing from extensive training in coaching, health and nutrition. Suzanne's personal experience helped her realize how important the mind-body connection is to complete wellness and her own self-care. Suzanne also teaches Scuba Diving for U.C. San Diego. for the past 25 years in La Jolla. Disclosure: Suzanne Weeks is an instructor of the HBB Healing Touch Certificate Program and has the right to use the intellectual property of the HBB Healing Touch Certificate Program Course of Study. Send check with completed Mail-in Registration Form (pdf). • In-depth solid core curriculum of 5 class levels from beginner to advanced healer including Evolution of the Healer, Holistic and Energetic Foundations, Evidence Based and Best Practice modules. • Enhances skills and knowledge through lecture, recommended readings and practice sessions. • Strong commitment to personal growth and knowledge of holistic health principles. • HBB Healing Touch Certificate Program Certificate of Completion upon satisfactory completion of all 5 levels. • Leads to eligibility to apply for Certified Healing Touch Practitioner through Healing Beyond Borders, Inc.
• Instructor Training and Advancement available after certification. Prerequisites apply. • Establishing a Healing Touch practice. 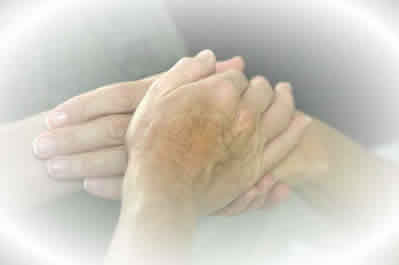 • Incorporating Healing Touch as a major focus within an existing professional practice. This continuing nursing education activity was approved by the American Holistic Nurses Association, an accredited approver by the American Nurses Credentialing Center's Commission on Accreditation. Disclaimer Statement: Approval for contact hours through AHNA is based on an assessment of the educational merit of this program and does not constitute endorsement of the use of any specific modality in the care of clients. HBB is approved by the National Certification Board for Therapeutic Massage and Bodywork (NCBTMB) as a continuing education Approved Provider. "This was a great class taught in a nurturing and supportive environment. It moved through the information at just the right pace. Suzanne is patient and kind, leaving plenty of time for questions and answers. Wonderful!" "The class exceeded my expectations. Suzanne is an excellent, compassionate teacher." "Best class ever taken…inspirational material & instruction." "The class was extremely informative and very well presented." "Suzanne has a wonderful way of educating to the learners ability and acceptance level. Very encouraging." "Very Interactive. The class exercises and demonstrations were very meaningful and most helpful." "Absolutely loved this class. Just learning to ground myself helps so much. Really improved my ability to focus and not feel drained. Thank you for the great opportunity to learn and grow." "Very comfortable environment. Very knowledgeable and sensitive instructor. Way more than what I expected! Awesome!" "Very therapeutic and healing environment. Great learning space. "This class was awesome. It was what I expected & more. I would definitely recommend this to others." "The environment was very calming and serene- a lovely place to spend a weekend in class." "Very professional and safe environment. Nurturing. Relaxing, intense, very informative." "Suzanne was a wonderful instructor. She provided a safe and caring environment for the class. She clearly explained the topics and was clear in answering questions. Classroom setting was comfortable and perfect for class size." "It was an incredible experience I will not forget. I did not expect this but it ended up being a personally healing experience as well. A gift to my life. Thank you for sharing healing touch with me! I'm so excited to practice and share all I learned with my family and friends." "So glad that I took this class & can’t wait to continue to the next level." or get answers about Healing Touch. Bring Healing Touch into your practice or studio. © 2007—2019 Healing Touch by Suzanne. All rights reserved.